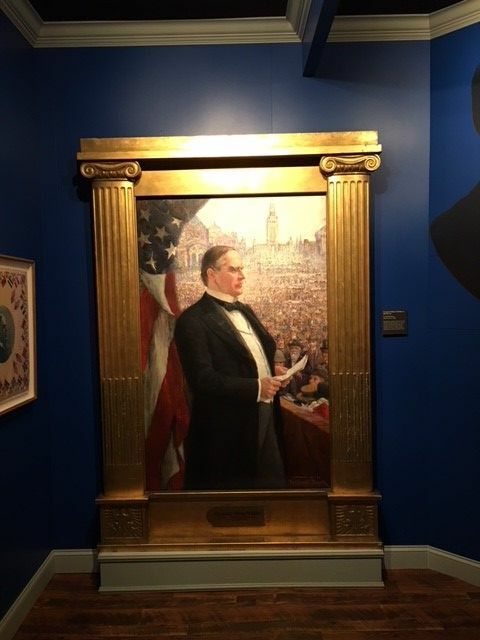 Photos by Jeffrey D. Brasie A painting of President William McKinley is seen recently at the Buffalo History Museum in Buffalo, N.Y.
EDITOR’s NOTE: Today marks the 117th anniversary of the day President William McKinley was shot by Alpena native Leon Czolgosz during the Pan-American Exposition in Buffalo, New York. What follows is a recounting of that day and its aftermath. BUFFALO, New York –The Buffalo Courier reported the Friday, Sept. 6, 1901 weather would be clear and sunny, with temperature in the low 70s. At this time, Buffalo — America’s eighth-largest city — was hosting the Pan-American Exposition, welcoming worldwide visitors. The city was one of the nation’s first large cities to be electrified, offering spectacular, newly lit-up parks, buildings, skyscrapers and shopping arcades. To boost the Exposition’s attendance, President William McKinley’s presence was highly publicized. On Sept. 5, before a crowd of more than 50,000, McKinley presented remarks calling for an end to America’s isolationism and expanded trade. Hearing his remarks were sections of America’s populous who professed themselves as anarchists, who believed any form of government exploited and oppressed the working people and aided only the few wealthy. 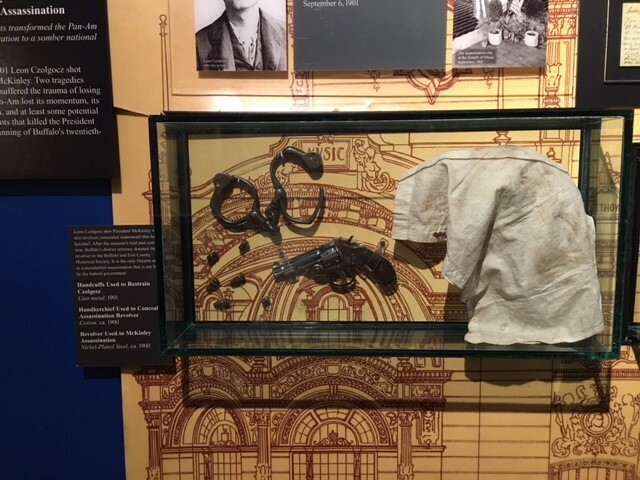 The revolver, ammunition and handkerchief Alpena native Leon Czolgosz used 117 years ago to shoot President William McKinley are displayed recently at the Buffalo History Museum, along with a set of handcuffs used to detain him. In the late 1890s and into the new century, the governmental model of open trade encouraged the European growth of anarchism. That led to the assassination of France’s president, the empress of Austria, the king of Italy, and a Spanish statesman. The political approach was now boiling over in the United States, where Leon Czolgosz — who was born in Alpena — was preparing to kill President McKinley. With the apparent knowledge of various anarchist institutions’ leadership, Czolgosz arrived in Buffalo from Chicago. He went to Walbridge’s Hardware Store and purchased a 32-caliber Iver Johnson revolver and ammunition. On Sept. 5, Czolgosz looked for the opportunity to assassinate McKinley while the president delivered remarks at the Exposition’s Temple of Music, but determined he may not have a clear shot. On Friday, Sept. 6 , the second part of a two-day presidential visit, McKinley and his wife, Ida, visited nearby Niagara Falls, returning later in the day to the Exposition. His wife returned to their temporary residence, the Milburn House. The president, however, continued to tour the Exposition. In mid-afternoon, he entered the Temple of Music to meet and greet dignitaries and guests. The Temple’s chairs were removed and a formal aisle to the president’s greeting area was temporarily blocked off. McKinley was heavily guarded by police and soldiers. Close to him was George Cortelyou, his personal secretary, George Foster, his security officer, and Exposition host John Milburn. The president greeted each person with a smile and handshake. When children were present, he exchanged pleasantries with them. As the line quickly moved forward, Foster noticed one man who had his right hand wrapped in a handkerchief. He thought that perhaps the handkerchief covered an injury or disfigurement. It was Czolgosz, ready to make his move. McKinley noted Czolgosz’s right hand being covered and reached out to shake his left hand. Czolgosz uncovered his right hand and two shots occurred amongst a veil of grey smoke. McKinley expressed a confused expression and leaned forward. He was caught by those surrounding him. An Exposition guest from Georgia, James Parker, along with Foster and security staff, disarmed and subdued Czolgosz. Quickly following were other attendees, who proceeded to beat the assassin. McKinley had one bullet graze a belt buckle or other clothing adornment, while a second entered his abdomen. The president was removed on a stretcher, accompanied by Foster. Both were placed on an electric-powered ambulance and transported to an on-site Exposition hospital. It neared 4:25 p.m. when the president entered the hospital. Drs. Matthew D. Mann and Herman Mynter conversed with McKinley and Foster. Mann administered ether to sedate the president, who murmured the Lord’s Prayer. They probed the president’s abdomen and were unable to find the second bullet. Dr. Roswell Park, the Exposition’s medical director, arrived after that procedure. He had been in Niagara Falls treating a patient. McKinley was stabilized and transported to the Milburn House, where his wife first learned of her husband’s shooting. In the early days after the shooting, McKinley appeared to rally and seemed headed for recovery. However, by Sept. 11, he began to exhibit confusion and signs of gangrene where the bullet had penetrated the stomach and infected the pancreas and one kidney. Vice President Theodore Roosevelt was immediately notified. With the president realizing he was dying, he was joined by his sobbing wife and close family members and friends. At 2:15 a.m. on Sept. 14, the nation’s 25th president died. During this period, Czolgosz was transferred from a Buffalo police precinct to the headquarters. The crowds swelled with vindictive hate while he was protected by heavy security. Czolgosz’s trial began on Sept. 23. Strangely, his defense attorney, Loran L. Lewis, gave a 27-minute address to the jury during which he praised the president but did little to defend his client. It is believed the lawyer took that approach to defend his position within the community. In less than 30 minutes, the jury found Czolgosz guilty. He was sentenced to death by electric chair on Oct. 29 at New York’s Auburn Prison. His body was covered with sulfuric acid before it was buried. With three U.S. presidents assassinated and prior attempts on other presidents, in 1906 Congress passed legislation officially designating the Secret Service to protect the president. 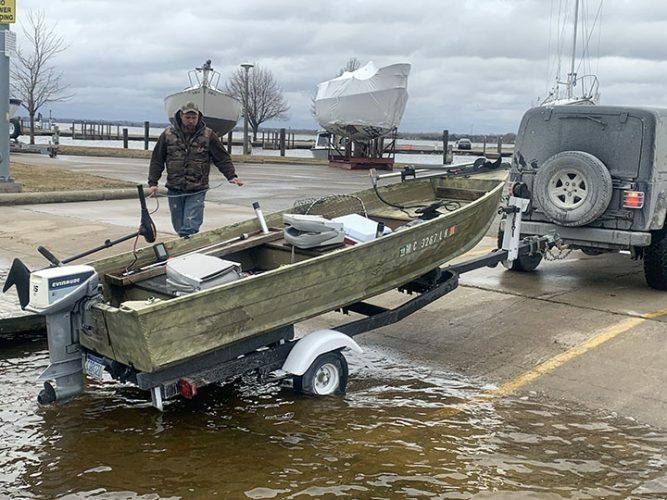 Brasie is a former Alpena resident. He is a retired health care CEO. ∫ In his late teens, he went to work as a steel laborer with the Cleveland Rolling Mill Co.
∫ On Sept. 6, 1901, he assassinated President William McKinley in Buffalo, N.Y.
News Photo by Steve Schulwitz Alpena County 911 dispatcher Pam Susan takes a call at central dispatch on Wednesday. 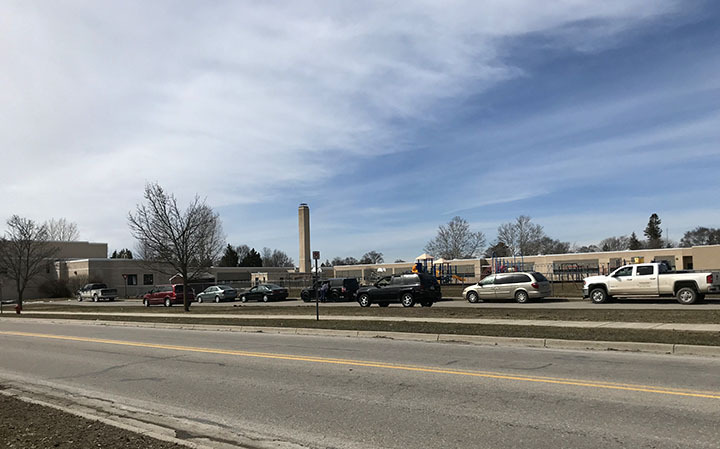 The county has entered into an agreement with Roscommon County that would allow for emergency calls from one county to be forwarded to the another if there is an outage. 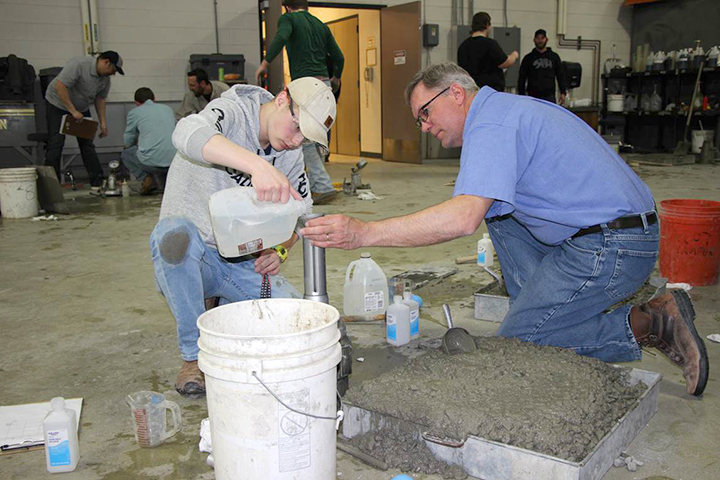 In the coming months, Oscoda, Crawford and Ogemaw counties are expected to be added to the agreement, as well.